STAMPS: Elzybells Art Stamps. INK: Memento Tuxedo Black. CS: Craftwork Cards, Doodlebug Designs. ACCESSORIES: Prima Flowers, Dew Drops, Copic Markers. Just gorgeous, and I love the purple dress! OH it's adorable Michelle!! 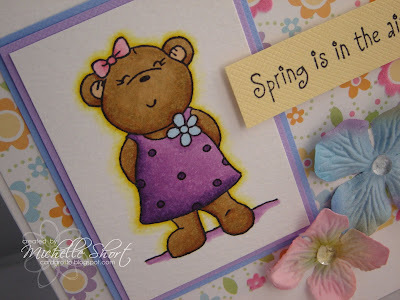 Love the soft colours and I ADORE Elzybells stamps!! Feel free to CASE me anytime!!! wowww Michelle,what a beautiful card,l love the image and colours. I love this Michelle. The image, the flowers and the pastel colours all co-ordiante so nicely together! She is stunning Michelle!! I love the way you have colored her in the purple dress!